I’ve entertained several in my life: becoming a doctor, having children, and writing a book. I accomplished the first over 20 years ago, before I was old enough and wise enough to realize that sometimes dreams don’t become a reality. I was blessed with the second dream a few years later. And the third? It’s a work in progress, and I’m happy to say I sent off the first completed draft to my publisher about a week ago. As I did, I was surprised by the feeling of being overwhelmed with a flood of different emotions. I anticipated being ecstatic, so why the tears running down my cheeks? -For me, both required about 9 months to deliver. Now the idea of writing the book came to me a couple years ago, and then came the long, arduous process of writing the book proposal and sending that to agents and editors. But from the time it was contracted with a publisher until I finished the first draft, it took almost 9 months. –There are obstacles along the way. With my pregnancies, there were questions regarding could I carry my babies to term, not to mention the physical obstacles…after a certain point I could no longer see my feet, nor reach the pedals in my car. With my book, there were health obstacles that sidelined me for months, there were assaults on my confidence and self-esteem, and there was the difficult balance between writing and my real job. -Both after the birth of my children, and after hitting “send” to email the manuscript to my publisher, I found myself overwhelmed with a flood of emotion: happy, excited, in shock, relieved, nervous, doubtful. For me, with both of them, after birthing them, I found myself pretty quickly wondering first, “What have I done?” then “What now?” Before you’ve experienced it for the first time, you really can’t be realistically prepared for either birthing a baby or a book. With both dreams, I quickly learned neither came with an instruction manual. The only thing I could be sure of was that God would lead and guide me-I didn’t have to figure it out on my own. With both a baby and a book, there were questions about how it would look and who it would resemble. Would they look like me? Would they sound like me? Would they be accepted and valued by others? They were both born out of obedience. My husband and I knew God called us to be parents, and not to do so would be selfish and disobedient. I too knew God called me to write this book. He called me to share my story. It would be hard, it would be messy and not very pretty many days, it would require pain, but not to do so would be selfish and disobedient. In that moment when the baby is born, and when I pushed “send” on the email sending my manuscript to the publisher, I experienced such an overwhelming flood of emotions. I was unprepared. I expected to be happy or excited, but overwhelmed? Panicked? Nervous? Sending the book to the publisher felt like handing my child over to a new babysitter or to be adopted…would they care for my baby like I would? I learned that no matter what the dream, it requires courage, creativity, and persistence. One thing I learned through both experiences is that if God brings you to it, He equips you through it. Perhaps the most important thing that I learned was that with God, your dreams can become your reality. What dream are you pursuing? In what ways does it stretch your faith? Thanks Gayle! Praying God uses it all for His glory!. Because of Him, Hope Prevails! I want to write for the Lord and point others to Him. I don’t care what form it comes in. I have worked as a reporter for radio and newspaper and worked in education. Now retired, I write a lot. I hope your book does well. Congratulation on the contract! Mary, He gives us lots of opportunities to be used by Him. I’m sure that whatever capacity He is using you, will be for His glory. Thanks for the encouragement on my book-I’m honored to be used by Him. Thank you Martha! My prayer is that He will use it to draw others close to Him! With dreams also comes work and sometimes a re-adjustment of our expectations. But if we follow after the dreams HE gives us, He promises to guide us and be right there beside us. 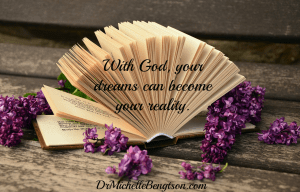 Here’s prayers for you as you look to your God-given dreams! Because of Him, Hope Prevails! We say our first daughter took 9 years instead of the usual 9 months. It was God’s timetable, not ours. I think each dream must be written on God’s heart. Some He knows will help us grow deeper in Him. Others, He knows would take us away from Him. I loved reading your thoughts on this and have saved it to read on the days the dreams seem far away. Pamela, I pray it encourages you on those days your hope may wax and wane. He promises to be faithful. He doesn’t always promise that His timetable will be the same as ours, as you have discovered. Seek ye first the kingdom of God and THEN these things will be added unto you!! Because of Him, Hope Prevails! Beautiful Michelle. I had a knot in my stomach when you talked about hitting Send. God will use it for His good and His purposes! #RaRaLinkup blessing to you today! Thanks Ellen. I had the very same knot 😉 But God is good. The good news is that I was obedient in doing my part, now I trust and leave it to Him to be faithful to do what only He can do! Because of Him, Hope Prevails! I hope your dream comes true. I’m sure God will continue to help you 🙂 Thanks for sharing your encouraging post with us at Together on Tuesdays! Thanks! So glad you stopped by! Blessings to you! I believe we were created to dream. They may not all come to pass, but dreaming brings life to our souls. I agree with you Aimee. I believe dreaming brings fresh hope. If we will yield to His desires for us, He will shape and mold our dreams to align with His good and perfect will. Because of Him, Hope Prevails. Thanks Rachel!! 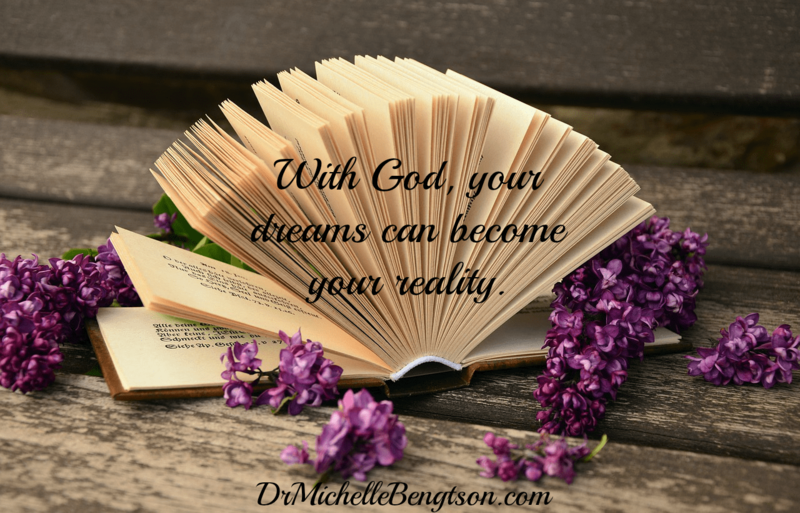 It’s never too late to dream with God! Because of Him, Hope Prevails! So glad you stopped by!! I can honestly say, there’s nothing that brings more joy than living the dream God instilled and provided for! Because of Him, Hope Prevails! I’ve often said the writing process is a lot like childbirth – a long labor with no epidural. 😉 God is so faithful and when He writes the dream over us, He promises His hand over the outcome too. Your words are full of courage and inspiration. Thank you for sharing them. Your neighbor at #belovedbrews. Tiffany, it’s comforting to know someone else agrees with the childbirth metaphor. Loved your comment about no epidural-That’s for sure!! I’m trusting Him for the outcome He desires! Because of Him, #HopePrevails! What a beautiful parallel. Our words are a piece of us. Every time we share them, we are are sharing a piece of our very being. You have described that so beautifully. This title grabbed me, Dr. Michelle. (I’m visiting today from Soul Survival). We are pursuing a call to missionary work that if it moves forward, would fulfill a lot of dreams we’ve been talking about for years in such an unanticipated way. We won’t know anything for several more months but we are excited to see what God has planned for us. Thanks for the inspiration to follow our dreams and to trust in God. Hope you are well! I LOVE knowing this Kristi!! I will be in prayer for you, that you will know His good and perfect will, that He will make it plain without any confusion, and that He will provide His resources to see you through the very dream He has planted in your hearts! Remember…Because of Him, #HopePrevails!! Love you Sweet Sister! Thank you Lori! I appreciate any and all prayers that God would bless this process and use it for His glory. One of my favorite things to say is that “It’s not over until God says it’s over!” So as long as you have breath, continue seeking after His dreams for you! Because of Him, #HopePrevails! Exciting! I’m looking forward to hearing more about your book. Dreaming is so good for our souls. Thanks for linking up at #ThreeWordWednesday. Thank you Kristin! 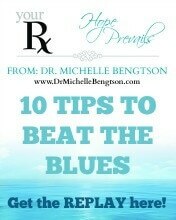 Be on the look out on my Facebook page (https://www.facebook.com/DrMichelleBengtson) for information about the launch! 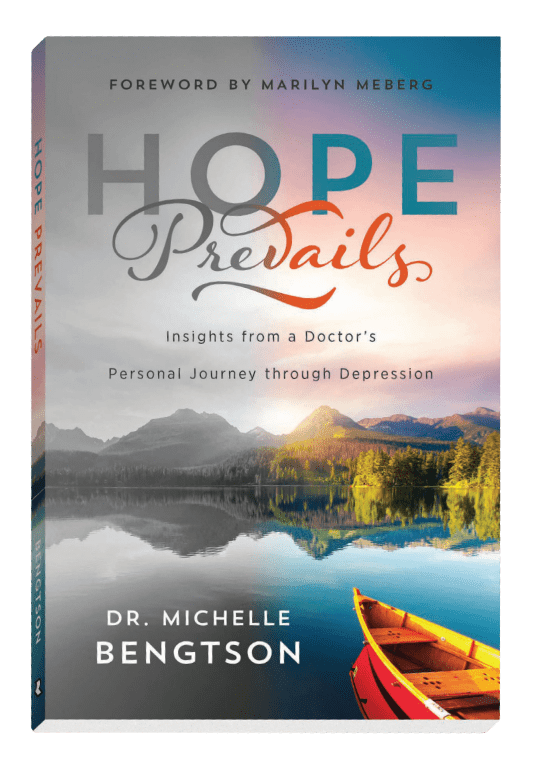 The book, “Hope Prevails: Insights from a Doctor’s Journey Through Depression” will be released in early to mid 2016 by Revell publishers, providing hope to those who struggle with depression or loved ones who have family/friends who struggle. It answers “Why?” do we struggle, and “How” does God care for us in the midst, and “What” must we do to overcome? I pray it is a blessing to many! Because of Him, #HopePrevails! So happy for you! I loved meeting you at a writing conference and hearing about what you were writing. I celebrate with you and look forward to reading. 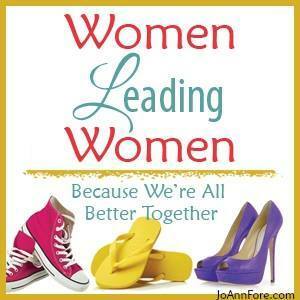 Let me know if you want to guest post on my blog when it’s time to launch. 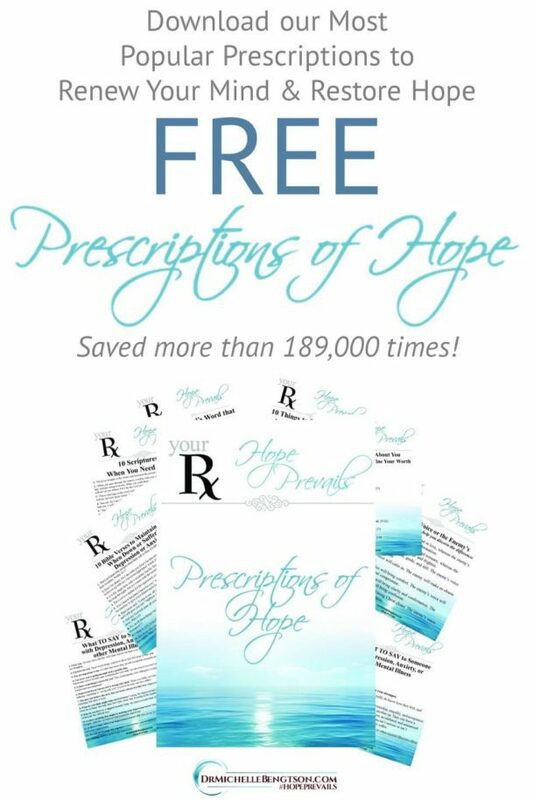 Love to help you spread the word! Yes Ginger! You were there when I met my current agent! So you were a part of the process. 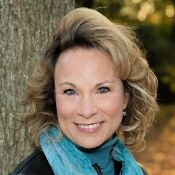 I’d love to guest post! 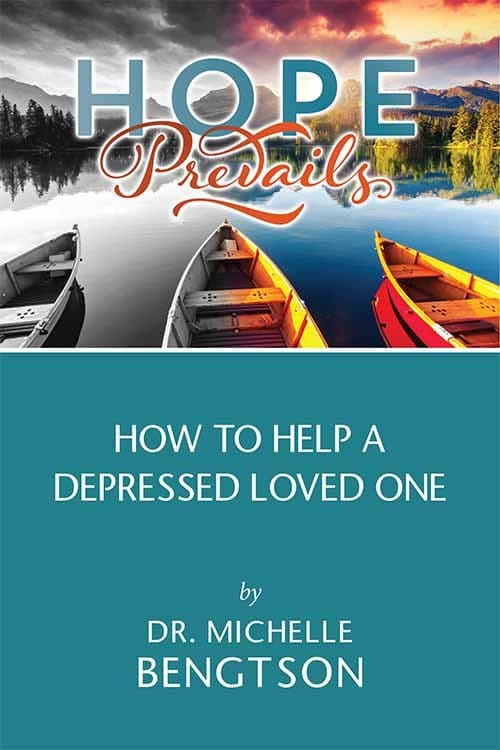 My prayer is that this book will touch the lives of many who remain entrapped in the valley of depression, so that they would know they aren’t alone, there is a reason they struggle, God gives provision through it, and there is a way out. Because of Him, #HopePrevails! Blessings on you Sweet Sister!!! What great news, and what an encouraging way of “delivering” it to us! Love it, Michele!! Weekly I just share what God has placed on my heart, and this was so strong, I couldn’t help but write about it. Hope it encourages someone today to keep seeking after their God-given dreams. Because of Him, #HopePrevails! I pray God blesses your book for His glory. I do see the parallels between giving birth and writing a book. I remember about half way through my 9 months of waiting for my precious daughter to be born that I panicked and thought that I really couldn’t do this but God gives you grace each day to do what we need to do and He will bless your efforts too. Thanks for sharing. I’ve had similar thoughts 😉 And then I remember that God has helped me through the difficult times in my life 100% of the time. He can be trusted. He is faithful. Because of Him, #HopePrevails! Thank you for sharing your story with us at #JoyHopeLive! Thanks for the encouragement Terri. The manuscript has been submitted and is scheduled for release early 2016. I’m working on the first round of edits right now and I’m trusting Him to equip me through this part! God is good! Because of Him, Hope Prevails! Congratulations on the birth of your dream! 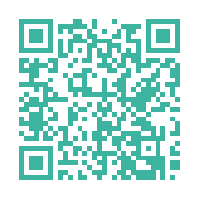 Let me know if I can be of any assistance in promoting it once it’s time to reveal :)! That would bless me to NO END, Anita!! Truly. That would be a gift. Thank you!! Because of Him, #HopePrevails! Simply beautiful. The birth of a dream….what a joy and blessing. Your words resonated within me in more ways than one. God does indeed lead and what a precious journey you have been on and continue to take. How I pray God uses your book in the lives of many people. May you continue to be a shining light in our world, dear Dr. Michelle. Thanks for sharing with Roses of Inspiration. Have a blessed week!